A medium-hard variety of copal resin obtained from the Copaifera guibourtiana tree native to the British colony of Sierra Leone in Africa. 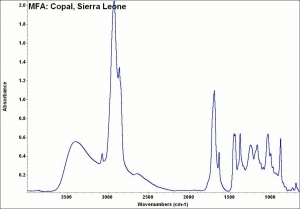 Sierra Leone copal is a pale yellow uniform resin that has been used in varnishes. Slightly soluble in acetone, amyl alcohol, ethanol, benzene, ether, turpentine. Saponification number = 146-150; Acid number = 109-114. Most copals fluoresce white under short-wave UV light. Combustible, burning with a bright flame, dense smoke, and strong smell. This page was last edited on 10 May 2016, at 12:12.